2016 Triumph Bonneville T100. Picture credits - Triumph. Submit more pictures. We took the most famous name in motorcycling and gave it some extra 60s style. Still distinctly a Bonneville with its smooth pulling, fuel injected 865cc parallel twin. We�ve added some visual tweaks like twin peashooter exhausts, chrome engine covers, black instrument surround with tacho, a Triumph logo on the seat, two-tone paint, spoked wheels and fork gaiters. Price as new (MSRP): US$ 9600. Prices depend on country, taxes, accessories, etc. Ask questions Join the 16 Triumph Bonneville T100 discussion group or the general Triumph discussion group. Bikez has reestablished Bikez.info motorcycle web shop overview. Here we present the major online shopping possibilities for motorcycle parts, gear and accessories. This includes customizing and insurance. Search and compare products and prices. 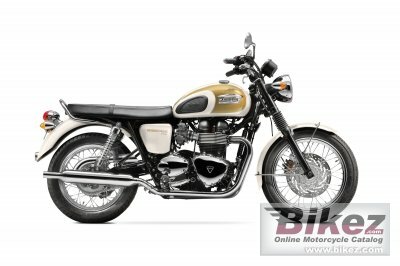 Try our 2016 Triumph Bonneville T100 discussion forum if you have questions or comments. Information about any technical issue is always welcome.